Vital Injector II is a revolutionary new technology for skin health using Hyaluronic Acid and needling. Hyaluronic acid (HA), which is naturally present in our body, performs a fundamental role in keeping the skin in good health. This essential element of the dermis retains water like a sponge so as to maintain its hydration. Using the Vital Injector II we have found, by depositing small amounts of hyaluronic acid just under the skin’s surface, you will have the effect of a needling treatment, coupled with actual plumpness and hydration right under your skin. Coupling a needling treatment alongside deposits of hyaluronic acid fillers, or skin boosters, you have the double-whammy effect of 2 treatments in one. The main reasons for the ageing of the skin include excess oxidants (free radicals) and progressive loss of intrinsic HA. An unhealthy lifestyle also contributes to skin appearance and quality. 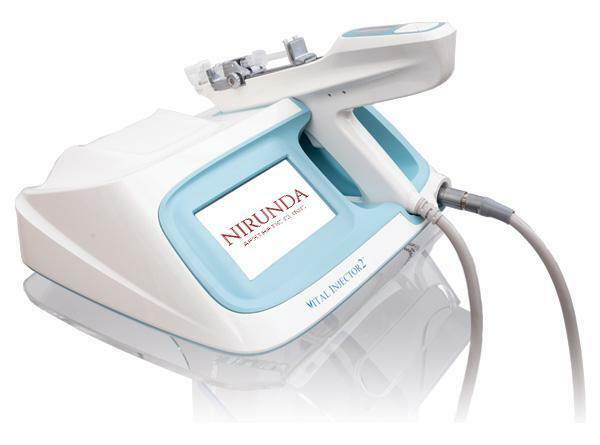 Nirunda is using the Vital Injector II to put hydration back into the skin, simply by depositing small amounts of hyaluronic acid just under the skin’s surface.